The third-party operator selected to run the ACR passenger train service between Sault Ste. Marie and Hearst is working through the conditions required to formally seal the deal. Economic Development Corp. CEO Tom Dodds said Railmark’s owner B. Allen Brown is working through conditions needed to ink the final agreement that will see the short-line railway company take over operations. “There are regular conversations between CN and Railmark and really, we’re at that point that all but one of the pre- conditions have been checked off,” Dodds said. Dodds said the “couple” of outstanding items not yet covered off are resolvable but it becomes a question of time. Both federal and provincial operating licenses have been obtained, as well as insurance. Dodds called the transition process a little more complicated and longer than expected, but that is partly due to the eleventh hour of the funding approval announcement and the number of things that needed to be done, all in a short period of time. The final transition to Railmark won’t happen until all the conditions are met, he said. In the meantime, CN continues to operate the service. “Council provided Railmark an approval in principal but they need to see the final agreement and that arrangement needs to give them a level of comfort with how all of this unfolds and demonstrates to them that they’re not on the hook,” Dodds said. Under the federal government’s funding plan, the City of Sault Ste. Marie is the recipient of the funding and it in turn needs to create a mirror agreement with Railmark. The agreement stipulates maximum amounts of funding per month, what expenses are eligible for funding and what documentation or receipts must be presented for reimbursement, among other things. Dodds said a monitoring committee will oversee the expenditures to ensure they meet the criteria for quick submission and reimbursement. He said it’s also important that there is a high degree of understanding between the city and Railmark on how the process will work and how funds will move back and forth. “We are attempting to minimize the amount of time anyone will be out of pocket and we want to make sure that the expenses are well documented and covered off as part of the agreement to demonstrate payment,” he said. Dodds said scheduling changes cannot occur until the agreement is signed and the stakeholders have a chance to examine the relative volumes of traffic and see what makes sense. “The government is funding a passenger service. Transport Canada is willing to be flexible but up to a point. They want to ensure that the service they are funding is being provided,” he said. Railmark will need to determine how to grow revenue through its other services and cut the costs associated with the passenger train service. Ultimately, it will be up to council to determine whether the agreement meets its standards and whether it is willing to take a limited risk and serve as a go-between for the funding transfer. Dodds said other community tourism groups needs to work with Brown to ensure the passenger train service is maintained. It’s expected that a working group meeting will be held shortly so that the stakeholders are all aware of the circumstances. 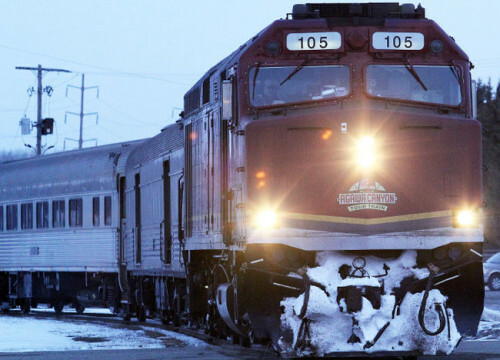 In April, it was announced that Transport Canada will provide $5.3 million of funding over three years for the continued operation of the passenger rail service between Sault Ste. Marie and Hearst. The announcement marked a year-long drive by stakeholders to develop a plan that would see the service eventually become self sufficient.